Exactly forty years ago this spring, my father was navigating a plane over the jungles of Vietnam. I was eleven, the oldest of three children in our family, and the one old enough to understand the harsh realities of war. That year marked the end of my childhood. It was a very difficult season. Not only were we separated from my dad, who was in a war zone, but my mom eventually suffered a breakdown from the stress and was hospitalized, leaving my brother, sister and me in the care of a neighbor. Since it was near the end of his one-year tour of duty, my dad was summoned (safely, thankfully) home. My mom recovered, and our family was whole once again. It was a year we were glad to put behind us and rarely discussed. So I posed the question to the Lord. And got nothing in response. Silence. A blank screen. The counselor suggested I wait. God would answer the question in His time and in His way. Several months passed. Still no answer. One Saturday afternoon while flipping through the television channels, I happened upon a PBS program about the Vietnam Veterans Memorial Wall. I had heard of this Washington D.C. memorial honoring those who lost their lives in the Vietnam conflict, and was eager to learn more about it. Seventy polished black granite panels comprise the wall, which stretches nearly 600 feet long and is ten feet high at its peak. Each panel is engraved with the names of those who perished or went missing, in chronological order. There are a sobering 58,272 names in all. I watched the screen intently as visitors to The Wall scanned the seemingly endless columns for the name of a loved one. Tears fell when they finally spotted the familiar name etched in shiny ebony. Some traced the letters lovingly with their fingers. Many stopped to place a piece of paper over the spot to make a rubbing as a memento. Others left behind flowers to mark a sacred place on that silent wall. I was watching over your dad while he was in Vietnam, so you wouldn’t have to make a trip to that wall someday. His voice was inaudible, yet clear and unmistakable. I was deeply touched by this tender expression of His love for me. And I had my answer. He hadn’t abandoned my family, even though it felt like He had. Though I had no conscious awareness of His presence during those dark days, He was there, and at work, carrying out His sovereign plan. In December of 2010, I had the opportunity to travel to Washington D.C. with my own almost eleven-year-old daughter and the Cheyenne All-City Children’s Chorus. One of our stops was the Vietnam Memorial. 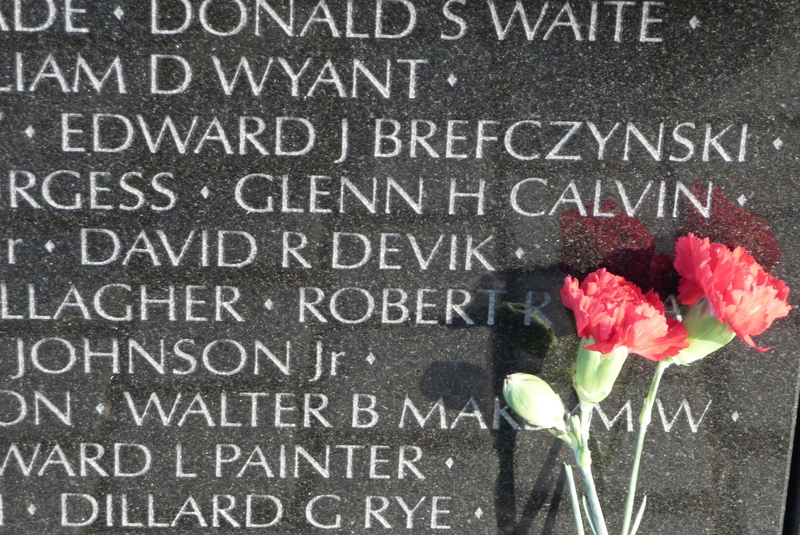 A guide directed me to the section of the wall representing the year my dad served. Quiet tears of humble gratitude slipped down my face. By the grace and mercy of God, I was not there on a pilgrimage in search of his name. Yet as I walked the length of that somber memorial, tears of another kind of gratitude stung my eyes and obscured my vision. Gratitude for those who did pay the ultimate price in service to their country. Gratitude for the sorrow their loved ones endured on behalf of an often ungrateful nation. And gratitude for a God who is greater than our grief and bigger than all of our unanswered questions.